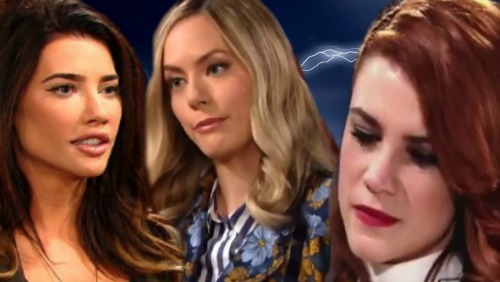 The Bold and the Beautiful (B&B) spoilers tease that Sally (Courtney Hope) could be on her way out. It appears the actress has been taken off contract, according to unconfirmed Twitter chatter, so that doesn’t sound like good news. Once Annika Noelle was hired as a Hope recast, many B&B fans expected that there wouldn’t be enough room for Sally. Honestly, how many women does Liam (Scott Clifton) need? Wyatt (Darin Brooks) would’ve been a great option for Sally and he still could be if she sticks around in a recurring role. However, The Bold and the Beautiful spoilers hint that Wyatt may remain in Katie’s (Heather Tom) orbit. B&B adores love triangles, so Thorne (Ingo Rademacher) and Wyatt will likely battle for Katie’s heart. Unless something changes, there may not be a place for Sally anymore on the 1/2 hour show. Of course, this could affect the rest of the Spectra gang. Sally’s the leader of her family and their close friends. If she’s out of the picture, the others will be as well. They can’t keep the Spectra clan going without out Sally at the center of it. That actually fits with a recent Soap Opera Digest blind item. The latest buzz hints that a once-popular soap family is about to fade away entirely. The Spectra reboot received mixed reviews, but this fam was certainly popular years ago. Now that Sally might be poised for a departure, the others could follow. Shirley (Patrika Darbo), Coco (Courtney Grosbeck), Saul (Alex Wyse) and Darlita (Danube Hermosillo) are all in danger of being written out. The Bold and the Beautiful spoilers say Sally will make some demands soon. She’ll go to Bill (Don Diamont) and insist that he needs to make things right. Sally’s tired of suffering because of Bill’s dirty moves. Spectra Fashions has been trying to rebuild their brand, but Bill’s setbacks have undoubtedly made that difficult. At some point, Bill might throw enough money around to finally be rid of his problem. Sally could set up shop somewhere else with a hefty cushion in case her business tanks for good. She would obviously take care of her employees and family members. Whatever the case, Courtney Hope’s future at the CBS soap is in jeopardy. Whether Sally stays or goes, she definitely won’t be getting a lot of airtime. How do you feel about Sally and the rest of the Spectra crew? Would you miss them if they left? We’ll give you updates as other details emerge. Stick with B&B and don’t forget to check CDL often for the latest Bold and the Beautiful spoilers, updates and news.